Commercial cooking equipment that produces smoke- or grease-laden vapors must have sufficient mechanical and structural integrity, resiliency and stability. This includes hoods, ducts, fans/air movement, fire suppression systems, and special grease collection equipment. These components must operate properly, and be easily accessible for cleaning and inspections. Only ENERVEX’s GSV Grease Fan is designed to support high exhaust temperatures at a high discharge velocity – reducing fire risk to operators, occupants and property while providing no-worries code compliance under NFPA 96 codes and standards. This easy-to-install grease fan provides adequate airflow in grease duct systems..
A full featured, industrial-type motor controller programmed specifically to control and adjust the speed of ENERVEX fans and ventilators using Electronically Commutated (EC) Motors or Induction Motors. PowerStack EPS system is a state-of-the-art, multi-application single or twin-walled exhaust product designed to convey gases, particles, fumes, smoke, grease and products of combustion. 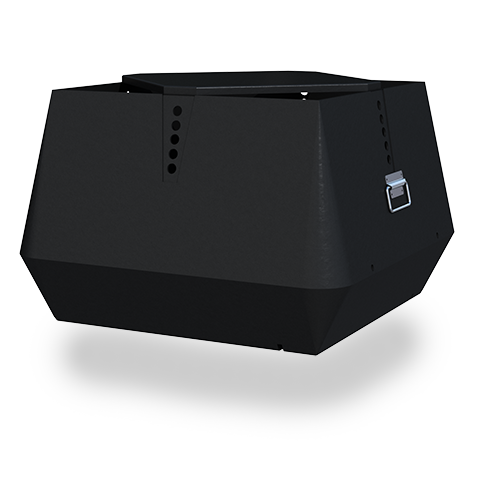 The RCF is a self-flashing type of roof curb and cap designed for use with GSV and EFV models on flat roofs.